Today in Armies of Australian Masters 2017 we have quite unusual army of Dwarfs commanded by the current Champion - Jeff. Jeff is a frequent tournaments participant and he also known to play with armies from many different factions. In fact, in the last season in nine events he used eight different armies! This army participates in each phase of the game. It has some long and short range shooting capabilities, units specializing in melee and enough elements to claim as many objectives as you want. It does not have Brocks or Organ Guns and that alone makes it quite a different force! 4 x 6 Earth Elementals - Summoned to war by the mysterious Stone Priests, these supernatural creatures are formed of the very earth and rock of the Dwarf holds - the living embodiment of the mountains come to protect their people! Another example of impenetrable wall of Defense 6+, Earth Elementals are very reliable units in the army and may form slow but moving battle line that would roll towards the enemy. They have "only" Crushing Strength (1) but their Pathfinder ability means that very little terrain is going to hinder them. In this army, however, they are not going to use their another important skill - Shambling, as there are no spell casters present! 4 x 10 Ironclad - Solid and uncompromising as rock, units of ironclads form the backbone of most Dwarf armies. Armed with axes or hammers and clad in heavy armour, these Dwarf warriors are tough, stubborn fighters, who form a nigh-unbreakable line of steel on the battlefield. These units have very good defense which they need due to low speed, meaning they usually don't necessarily pick the fights. However, in this force they may be overlooked and not considered a priority target for the enemy as other elements seem to be far more dangerous. The question is, is that really the case? 3 x 5 Sharpshooters - unlike the Ironwatch, Dwarf Sharpshooters are recruited from among the hardiest apprentices in the Warsmiths' guild-temples. Bringing the latest long-ranged blackpowder weapons to war, their units are one part deadly sniper regiment and one part experimental field-testers. Long range support, Sharpshooters can inflict damage even against the most heavily armored foe. While needing to remain in place in order to shoot, three units can guarantee something will hit the chosen target. They also provide flexibility as they can focus fire on a single unit or spread it among different elements of the enemy army. 3 x Flame Belchers - This weapon belches gouts of flammable liquid over the Dwarfs' foes, consigning them to a horrible death. Despite its short range, it is the ultimate area-denial weapon due to its fell reputation. These war engines are very dangerous and can make the enemies thing twice before committing forces to the melee as even if they succeed in breaking the wall of Earth Elementals, these war engines will be waiting to unleash nasty surprise. They are also great to discourage any enemy fliers to land behind Dwarven lines. 3 x Battle Driller - The Dwarf Miners guild has long used technological innovations to aid in its excavations. Some members of the guild take their drilling devices to battle, charging them into the enemy ranks with spectacularly unpredictable results. These "Monsters" are to aid the army in close combat and can do it very well. First, they can provide quite a large number of attacks and are small enough to sneak in and add to the combat. Second, with their extra mobility, even at a short range, they may potentially attack in every direction, which is definitely a great asset. 2 x Army Standard Bearer - It is the greatest, most solemn honour to carry one of the Dwarfs' revered banners to battle, and only the most loyal retainers of the noble houses are entrusted with this duty. These ancient banners are older than any living dwarf, often inscribed with the feats of one of the noble houses. These two heroes would provide always needed sources of inspire. Please, let me know what you think about this unique army! 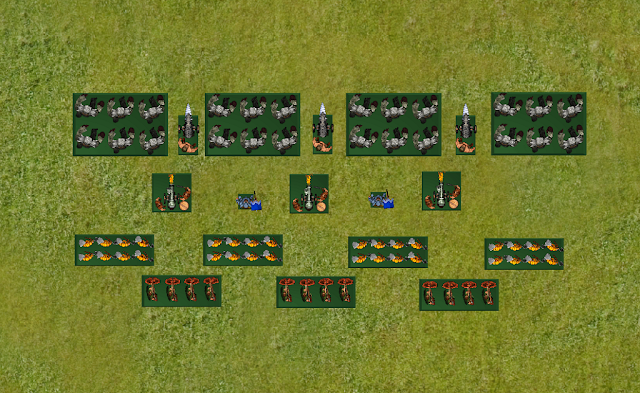 The list seams to have many deployment options, with either making a denied flank or spreading out accross the board. With breath 54 hamper the flanks or make units think twice about going near piercing 2 Sharp shooters the small units of ironclad can be used to gain flanks or chaff the hell out of you or gather objective markers or hold board quarters. The army also had def 5 minimum accross the board making opponents need to have lots of crush or thunderous to be effective against this force crushing would be better to negate the def 6 over time. This would be a very tough match up for your msu. I assume every game will be a tough match up for me because I will be playing against a Master player each round! For me, the army list is a function of the player's skill, approach to particular faction etc. This army is certainly unique and it would be very interesting to play against it, especially when commanded by the current Master. I really wish I could play a game against every army and player who is going to participate in that event! It's an interesting list. Few armies can outdeploy it. It might be a bit slow though. Lots of chaff and throwaway units. Battle drillers are super good for their points. I think this army is one of the forces people didn't really expected to see and that may be an advantage for Jeff in itself!